Reid Lifting, a manufacturer of lightweight gantry cranes, has bolstered the stock of two distribution partners in Holland. 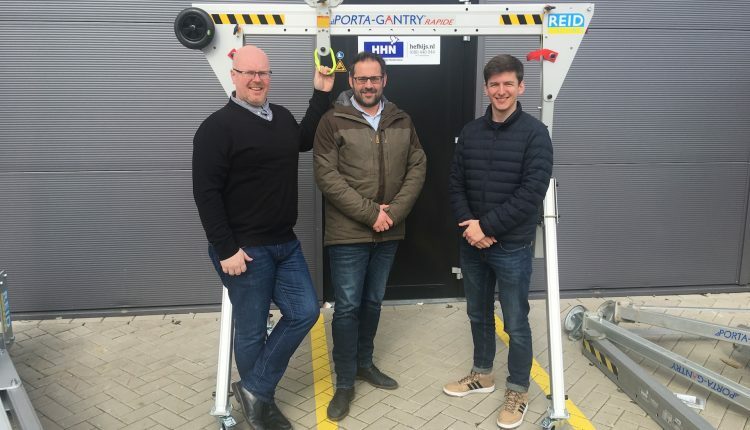 Rental equipment company Boels Verhuur B.V Sittard and Hef & Hijs Nederland B.V. (HHN), a subsidiary of the international Boels hire empire, have both taken delivery of Porta-Gantry and Porta-Gantry Rapide units, in addition to lifting accessories. The orders add to existing fleets at Boels and HHN. Boels, which has a history of acquisitions, added HHN to its portfolio as a specialist provider of lifting and hoisting equipment in the Benelux countries. Boels itself offers a broader equipment range, covering powered access, earthmoving, landscaping, handling, and more from a multitude of depots across the UK and central Europe. The Boels order included nearly 60 gantries of varying height configurations and beam lengths, and covered the breadth of the Porta-Gantry capacity range from 1,000kg to 5,000kg working load limit (WLL). The HHN order, meanwhile, included 20 Porta-Gantry cranes in the 2,000kg to 5,000kg range, as well as seven Porta-Gantry Rapides, plus accessories. The new Porta-Gantry Rapide is a higher capacity version of the manufacturer’s 500kg capacity units of the same name. Each gantry offers three height and length options, meaning nine variations are available at each capacity. The 1,000kg Rapide expanded on an already renowned range, which brought a new level of portability and ease of assembly to the gantry crane market when it was introduced back in 2011. The Rapide is both goods and personnel rated (tested for up to three people as a fall arrest system), further enhancing its versatility. Reid was recently acquired by Pure Lifting, a holding company formed to create a global portfolio of innovative, portable equipment businesses. Caption:Mike Tilly (left), of HHN, and Bastiaan de Koning (centre), of Boels, with Reid’s Tim Battersby, at HHN headquarters in Dordrecht, Netherlands.